Now in a completely revised and updated edition, this book will be a valuable resource for all grades of staff within the multi-disciplinary team caring for patients with burn injuries. It aims to increase the reader?s understanding of the effects of burn trauma on the individual, and it outlines the management of care that will be required during the course of hospitalisation. The book considers the treatment needs of patients of all ages with different types of burn injury, in a variety of clinical environments. This text will prove to be an additional resource for those nurses undertaking diploma or degree level nurse education programmes and/or post-basic education relating to the speciality of burn care. 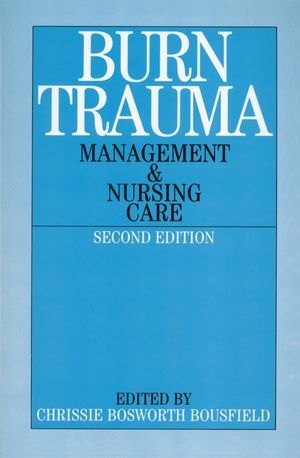 Chrissie Bosworth-Bousfield is the author of Burn Trauma: Management and Nursing Care, 2nd Edition, published by Wiley. Nursing children following burn trauma. Management in the first 48 hours following burn trauma. Ethical decision making in burn care. Management of the patient with an inhalation injury. Management of pain for an individual following burn trauma. Early wound excision and grafting. Nutritional care for an individual following burn trauma. Social reintergration for an individual following burn trauma. Burns aftercare and scar management. Psychological care following burn trauma. Burn trauma and post-traumatic stress disorder. Staff support on the burns unit.